A spate of lightning-caused wildfires in Southwest Alaska is keeping the state’s wildland firefighters busy. Ten new fires were reported on Sunday due to lightning strikes and one additional fire was reported on Monday due to lightning, according to the Alaska Division of Forestry. The highest priority fire is the 500-acre Bell Creek Fire burning about 2 miles north of the village of Crooked Creek on the Kuskokwim River, approximately 110 miles southwest of McGrath. The fire was reported Sunday afternoon by village residents after a thunderstorm moved through the area. State forestry responded with a load of smokejumpers from the BLM Alaska Fire Service that had been moved to McGrath due to the high fire danger in the area. The fire was estimated at 40 acres upon the smokejumpers’ arrival. Two air tankers dropped retardant around the fire and the smokejumpers worked late into the night to suppress the fire. 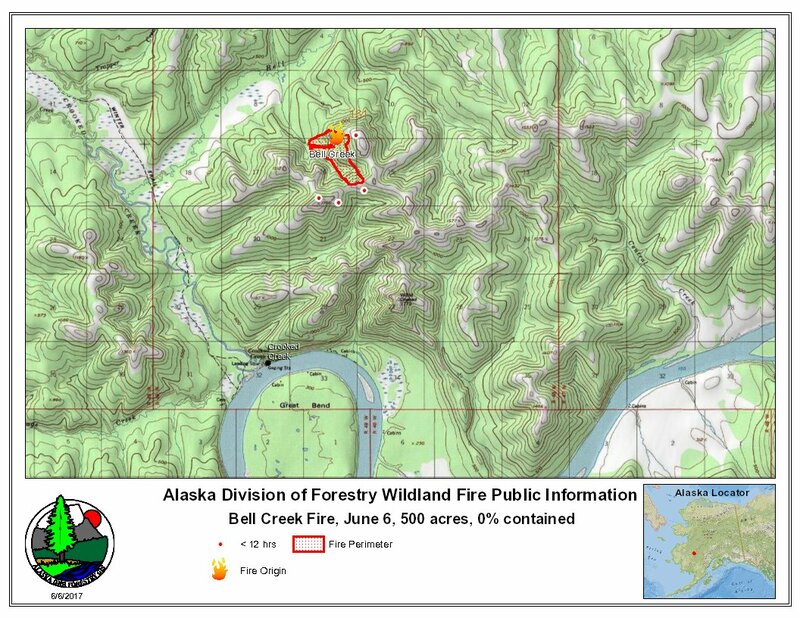 A perimeter map of the Bell Creek Fire burning approximately 110 miles southwest of McGrath and about 2 miles north of the village of Crooked Creek on the Kuskokwim River. The fire mushroomed to 500 acres on Monday night with extreme fire behavior that included running, torching, crowning, spotting and backing. Air Tankers responded with two loads of retardant to assist firefighters on the ground but the decision was made Monday night to change suppression tactics from direct attack to structure protection in the village due to the extreme fire behavior. All personnel on the fireline with the exception of four smokejumpers were moved to the village. The Pioneer Peak Interagency Hotshot Crew was shuttled to the fire on Tuesday, putting the total number of personnel working on the fire at 48. A Type 3 organization is being formed today to manage the fire and make a plan to protect the village if needed. • Fire #167, Akuliktuak River, 50 acres – Located approximately 20 miles east of Bethel and about 5 miles east of the village of Kwethluk in a full protection area. The fire was reported by a resident in Kwethluk around 7 p.m. Monday. A load of eight smokejumpers was dropped on the fire, which was estimated at 50 acres on initial size up. No structures were in the immediate area. Smokejumpers worked late into the night and reported the fire to be 90 percent contained as of Tuesday morning. • Fire #155, Spruce Creek, 35 acres – Located 30 miles west of McGrath in a modified protection area. It was reported Sunday by a resident in the village of Takotna near the Spruce Creek Mine. The fire was estimated at 5 acres on the initial size up and burning in black spruce and mixed hardwoods. A helicopter and air attack responded to the fire to drop off a five-person helitack crew and begin making water drops. Two air tankers responded to make retardant drops and a load of smokejumpers was dropped on the fire to take suppression action. The smokejumpers were replaced by a Type 2 crew from Nikolai on Monday afternoon. The Nikolai crew began to grid the fire and found 20 hotspots. Gridding and mop up will continue today. • Fire #157, Brown Creek, 23 acres – Located 35 miles west of McGrath in a full protection area. It was reported by a helicopter working on the nearby Spruce Creek Fire but due to higher priorities the helicopter was not able to provide an assessment. Air attack flew the fire and sized it up as 15 acres burning in black spruce and tundra. There were creeks one mile to the north and one mile to the west. Helitack from McGrath and the Nondalton Type 2 Crew were flown to the fire Monday to secure the perimeter. The fire was 50 percent contained as of Tuesday morning. The crew will continue to grid and mop up. • Fire #164, Ball Creek, 2,000 acres – Located approximately 75 miles southwest of McGrath in a full protection area. It was reported by air attack working on the Bell Creek Fire. The initial size up was 30 acres and was burning in black spruce. The fire had grown to 300 acres as of 2 p.m. on Monday and increased to 2,000 acres when flown again Monday night at 7:30 p.m. Due to higher priorities, a shortage of resources and the fact no values at risk were threatened, the fire was placed in monitor status. • Fire #163, Sullivan Creek, 100 acres – Located approximately 45 miles east of McGrath in a modified protection area. It was reported by air attack en route to other fires. The intial size up was 1 acre but the fire had grown to approximately 50 acres later the same afternoon. A flight Monday night estimate the fire had grown to 100 acres and it is burning in a combination of mixed hardwoods, black spruce and tundra. No structures were immediately threatened and the fire is being monitored. 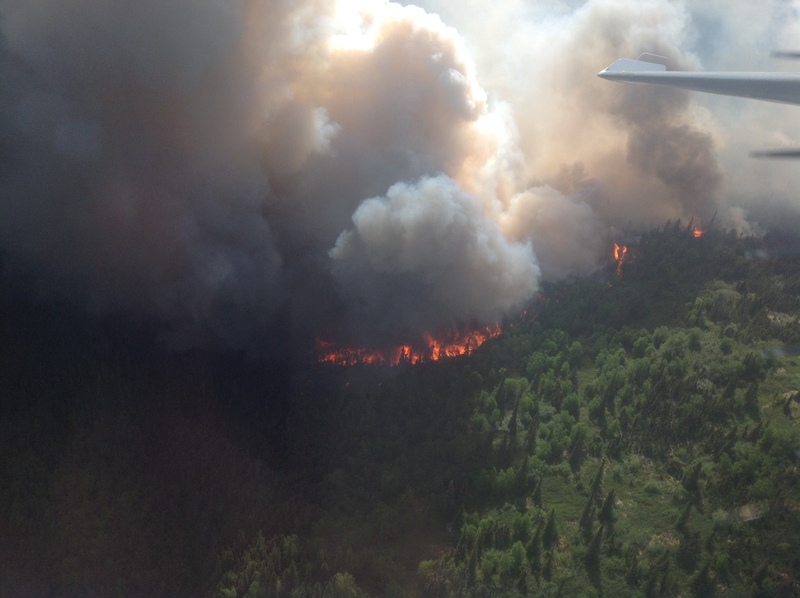 • Fire #160, Pitka Fork, 1,000 acres – Located approximately 60 miles east of McGrath in a limited protection area. It was reported by air attack en route to other fires in the area. The original size up was 10 to 15 acres with crowning and torching in mostly black spruce. The fire was later flown over by a helicopter traveling to McGrath and had grown to 300 acres. The fire was flown again Monday evening had increased to 1,000 acres. No structures were threatened and the fire is being monitored. • Fire #159, Little Yetna River, 1,000 acres – Located approximately 100 miles southwest of McGrath in a limited protection area. It was reported by a plane shuttling smokejumpers to another. A plane was launched from McGrath to get a size up and upon arrival the fire was estimated at 10 acres, burning in a mixture of tundra and black spruce with 8- to 10-foot flame lengths and torching on the eastern edge. The fire was flown Monday evening and had grown to 1,000 acres. No structures were threatened and the fire is being monitored. • Fire #158, American Creek, 4,000 acres – Located approximately 42 miles west of McGrath in a limited protection area. It was reported by a helicopter working on the nearby Spruce Creek Fire. Air attack later flew the fire and assessed it at 3 acres burning in tundra and grass. The fire was flown on Monday evening and it had grown to 4,000 acres. Nothing was threatened and the fire was placed in monitor status. • Fire #154, Pikmiktalik River, 185 acres – Located approximately 25 miles north of Bethel in a limited protection area in the Yukon Delta National Wildlife Refuge. The fire was discovered by a smokejumper aircraft en route to the nearby Tubungaluk Creek Fire, which is roughly 5 miles to the southwest. It was sized up as 10 acres, creeping and backing in tundra. The fire was flown by U.S. Fish and Wildlife Service aircraft Monday afternoon and was reported it to be 185 acres and 40 percent active. The fire was creeping and backing in the tundra with multiple bodies of water checking the fire spread. No threats to structures or other resources at this time. • Fire #152, Tubungaluk Creek, 300 acres – Located approximately 30 miles northeast of Bethel in the Yukon Delta National Wildlife Refuge. It was reported by a private aircraft through the Bethel Flight Tower. Smokejumpers were sent from McGrath to perform a reconnaissance of the fire and found it to be 1 acre, 5% active, and burning in tundra in a limited protection area. The fire was flown by the U.S. Fish and Wildlife Service on Monday and it had grown to an estimated 300 acres. It was 40 percent active, creeping and backing in tundra with multiple bodies of water to the north and south. No resources are currently threatened and the fire is being monitored.